The Pineapple shape was first introduced by Samual Kamaka in the mid 1920's and was patented in 1928. It is said that the original intent was to speed up production by eliminating side bending. However the result was an instrument that was more mellow sounding that the traditional shape. A friend of Samual's commented that it looked like a pineapple, and Sam had an artist paint the top to look like one, a tradition that continues with many luthiers (including myself) today. 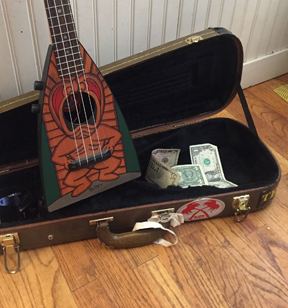 Of the many Pineapple shaped Ukuleles produced over the years, Kamakas are the most prized. Of the same era were Ka Lai Who's Uke's are very similer. Interestingly the patent date for both Kamaka and Ka Lai are Jan 3 of 1928. This is no accident, as they were both produced in the Kamaka Factory, but Kamakas were of Koa, and Ka Lai were of the less expensive Monkeypod wood.